Yes, we’re putting up Christmas trees already. That’s just the way we roll around here. 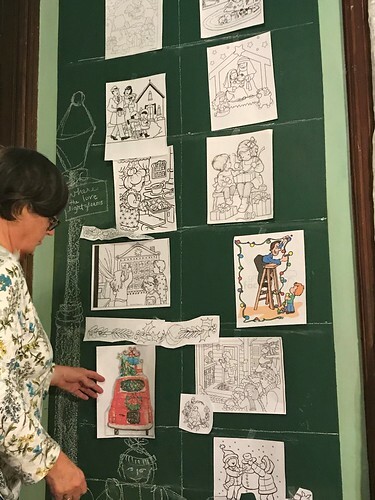 We do a lot of decorating, so we need to start early if it’s to be a pleasant experience! 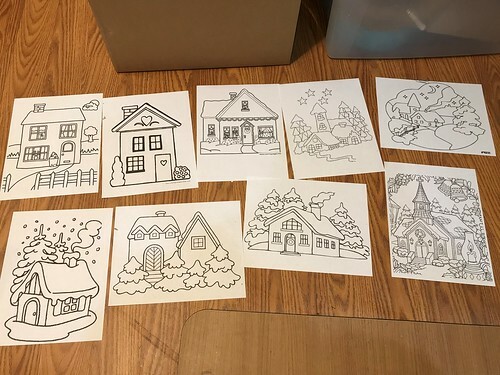 This past weekend, my sister came to help. 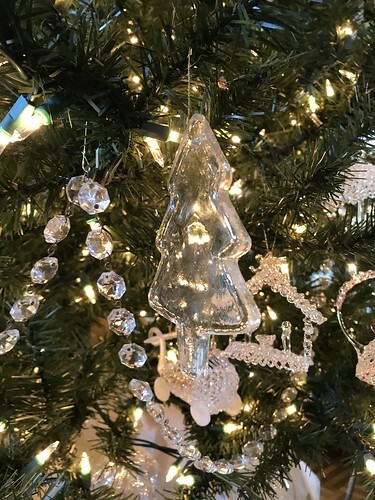 We put up the “glass tree” which is an artificial tree decorated completely in glass ornaments. Mostly clear glass but there is some colored glass and some frosted glass, as well. I still need to add more ribbon to fill out the tree topper. 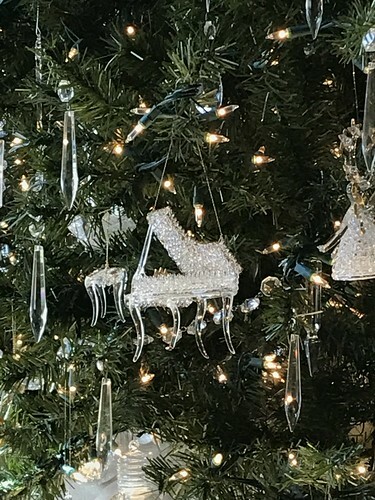 A grand piano with a piano bench is surrounded by some of the 250-plus prisms that decorate this tree. The prisms came off two chandeliers that were in our present home when we bought it more than twenty years ago. 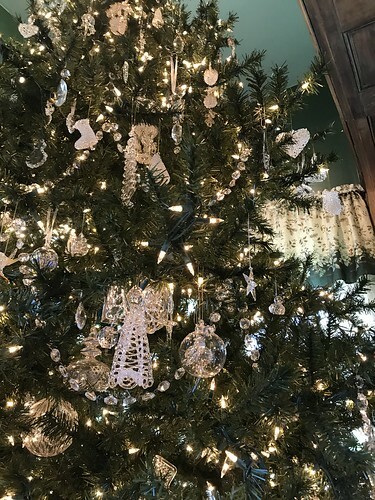 We also use the glass chains from the chandeliers to decorate this tree as garlands. 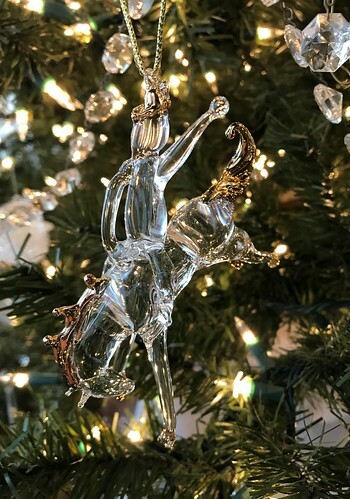 One of my favorite ornaments is this bucking bronco, complete with cowboy. 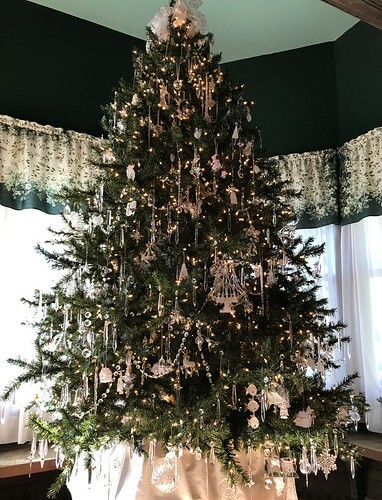 The tree is a seven-foot tree. It stands on a two-foot high box that my husband made for use as a tree stand. The ceilings are twelve feet high, so it helps to fill the space if the tree sits on top of a box. 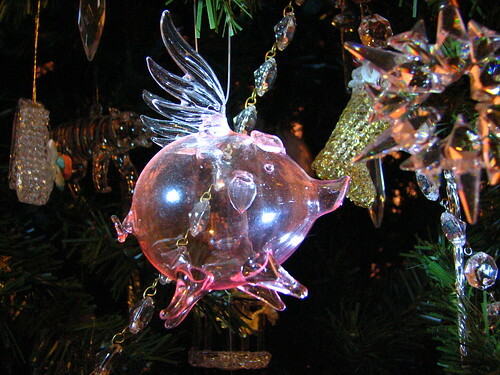 If you had asked me thirty years ago if I’d ever have a tree completely decorated in spun glass, fused glass and crystal, I might have said, “When pigs fly!” But the collection, which started with a glass hummingbird in 1984, has grown and grown. Now it is my favorite tree of all the ones we put up each year. 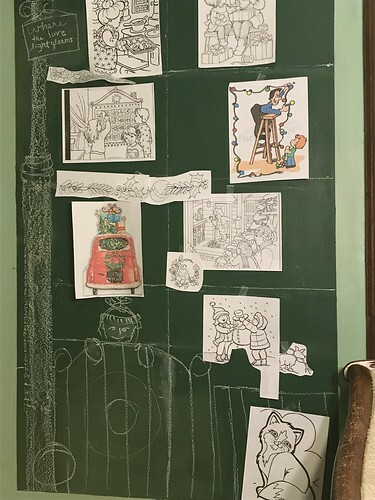 We also worked on another favorite tree, the chalkboard Christmas tree. As often happens, my original plan for the tree changes, and is edited and nipped and tucked until I think it’s just right. 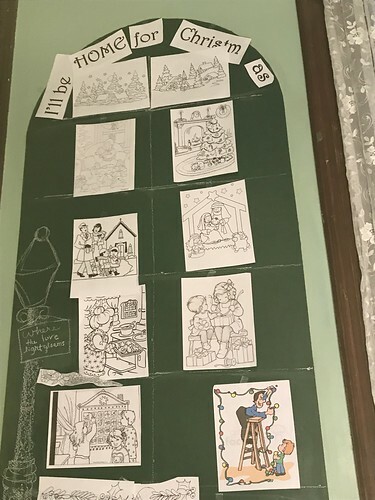 This year, the theme “I’ll be home for Christmas” stayed the same, but the pictures changed. I began with pictures of houses, but decided to go with pictures of the kinds of things that draw us home at Christmas. 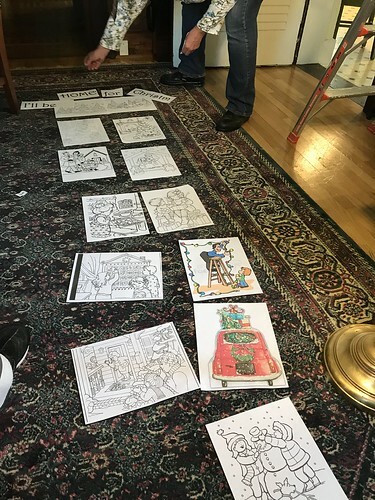 I print pictures from online (many of them are coloring pages) and we arrange them on the floor, in a way that tells the story of our theme. 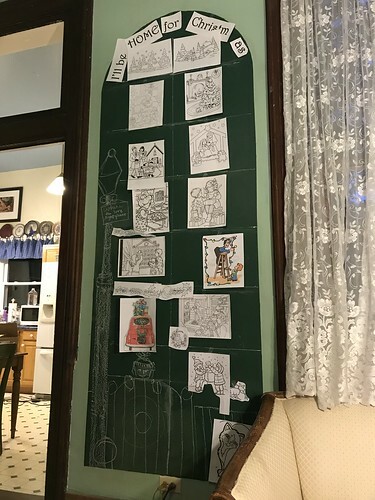 The next step is to tape them to the wall, step back and check the balance, then start the job of copying them to the chalkboard, using graphite paper. We have a lot of work ahead of us. It will be amazing to watch how it comes together. You can find links to our previous chalkboard Christmas trees here: Chalkboard Christmas Trees. Stay tuned! I’ll bring you more updates to our progress as we move along. This entry was written by ~~Rhonda, posted on October 8, 2018 at 3:29 pm, filed under Christmas. Bookmark the permalink. Follow any comments here with the RSS feed for this post. Post a comment or leave a trackback: Trackback URL. Beautiful! 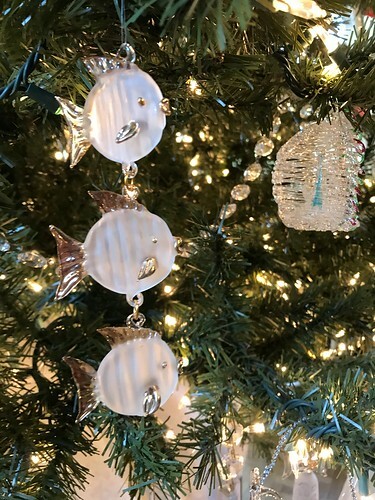 This makes me so excited to decorate my trees.